Although the largest Muslim-majority nation in the world, Indonesia is also home to a great variety of religious and ethnic communities that inspired the country’s motto, Bhinneka Tunggal Ika (“Unity in Diversity”), making it a pertinent host for the Interfaith Assembly. As a country that continues to face threats from identity-based conflict, like many others around the world, it is important to explore models of collaboration amongst diverse communities like those in Indonesia. 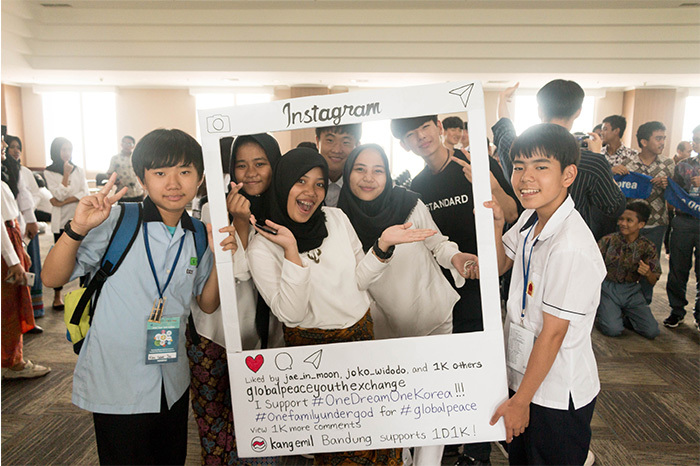 Participants of the Interfaith Assembly had the opportunity to discuss the role of youth in addressing identity-based conflict through interfaith partnerships and using social media as a positive contributor to peace and development in their regions. Youth also had the chance to visit Taman Mini Indonesia Indah, a unique estate that includes buildings representing the variety of architecture and culture of a variety of regions as well as places of worship for the many religious traditions Indonesia is home to. Participants also visited the largest mosque in Southeast Asia, the Istiqlal Mosque and the Cathedral Church built just across from it, another symbol of solidarity and harmony amidst the diversity of Indonesia. Other speakers and sponsors of the 2017 Global Peace Youth Interfaith Assembly included Inayah Wahid, the daughter of the fourth President of Indonesia, Abdurrahman Wahid, and Forum Kerukunan Umat Beragama (Interreligious Harmony Forum).